A statewide rail plan wants to better connect urban rail lines like Metro to statewide routes, potentially including high-speed rail lines. Photo by Thomas R Cordova. As the closure of sections of the Blue Line looms in the near future, Metro officials updated the City Council Tuesday night as to how the transit agency’s projects will impact Long Beach. 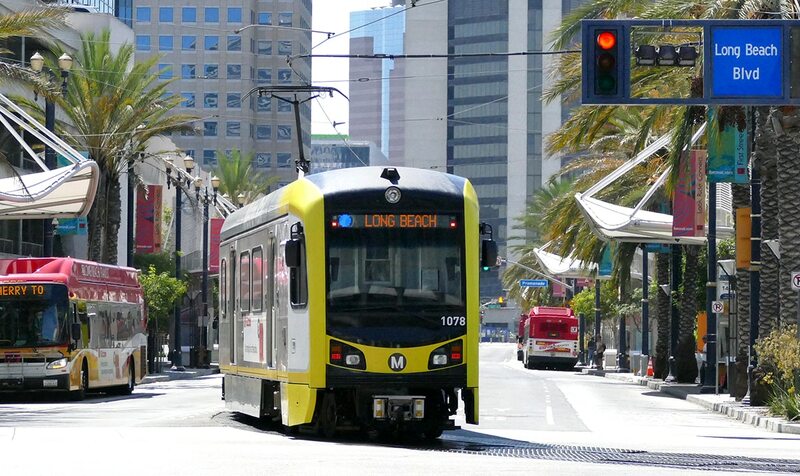 A pressing question for riders has been how the eight-month, $1 billion overhaul of the line that connects Long Beach and Los Angeles, and the recently announced shuttle service that will transport riders in the interim, will impact daily commutes. Anthony Crump, Metro’s director of project management, said the impact should be minimal. While the agency is still in the process of finalizing the route for which shuttles will take passengers from Long Beach to various stops along the Blue Line, Crump said the shuttle trip should take “about an hour,” or about as long as the Blue Line currently takes. Crump said the route will include a mix of surface streets and freeways depending on which of the three tiers of shuttle buses a passenger takes. The free version of the shuttle will hit all current stops along the Blue Line while two other paid express versions of the shuttle will hit limited stops along the route and cost riders about $1.75. All shuttles will service all Long Beach stops using the Wardlow Station as a separation point from which express shuttles will begin skipping stops and the free shuttle will continue along the Blue Line’s route. Mayor Robert Garcia noted that there have been preliminary discussions about keeping one of the express shuttles in operation after the Blue Line reopens. “While the outcome is going to be excellent and we’re going to end up with a better system and good ridership and hopefully all of the things that we want, that shutdown is going to be very significant for thousands and thousands of people who use the Blue Line everyday to get to work, to get to Downtown Los Angeles, to connect and go to the airport. I know that we’re going to do everything that we can to ensure that that is the least impactful for folks here in Long beach,” Garcia said. The southern part of the line is expected to be closed for four months starting at the beginning of 2019, with the northern segment of the line being closed for the next four months. The Willowbrooks/Rosa Parks station that connects the two portions of the line is expected to be closed for the entirety of the eight-month construction window as Metro works to both revitalize the station and make it into a transit hub. Other improvements being made along the route range from track and overhead power enhancements to completing pre-tie in work to the regional connector. The latter would help connect the Blue Line to the Expo and Gold Lines which would allow for a “one-seat” ride from Downtown Long Beach to Azusa. How the closures will impact ridership after the overhaul is complete remains to be seen. Metro leadership has conceded shrinking ridership on both buses and trains in recent years, with rider surveys showing that safety on Metro was large part of why some riders had opted to find other modes of transportation. When the Blue Line fully reopens in the fall next year, and shuttles are phased out, Metro is hopeful that its riders will return to see a brighter and more efficient system.